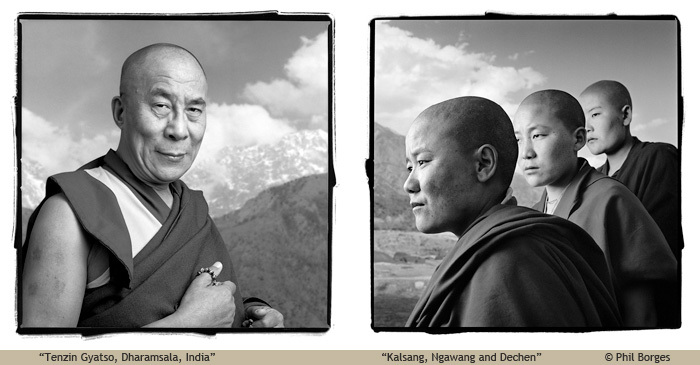 Beginning in 1994 Phil Borges traveled to Tibet as well as northern India and Nepal to interview and photograph Tibetans and Tibetan refugees in an effort to understand what had happened to them, to their country and their culture. These are some of the people he met from this deeply spiritual culture—everyone from the nomads of the remote Himalayas to the Dalai Lama himself—each committed to their unique Tibetan culture and to the practice of compassion in the face of ongoing challenges in their lives and occupied homeland. In support of the Tibetan people and culture, he published his book Tibetan Portrait: The Power of Compassion. This special collection of hand-signed hand-printed black & white silver gelatin photographs is drawn from those images, quantities are very limited and availability is subject to prior sales.